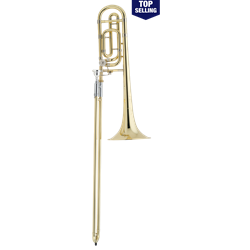 The Bach TB200B is a .525" medium-large bore F attachment tenor trombone made with an 8" two-piece hand-hammered yellow brass bell finished off with a soldered bell wire making it extremely responsive with a colorful and broad sound. The traditional wrap F section promotes clean attacks and stability. The chrome plated nickel silver inner handslide tubes provide the ideal surface for smooth and quick handslide action. The clear lacquer finish provides a subtle warmth to the overall sound. The TB200B is a well designed durable instrument perfect for the students and amateur musicians and is well suited for all types of music. TECH SPECS .525" bore Key of F/Bb 8" yellow brass bell Standard wrap F attachment with standard rotor Yellow brass outer slide Clear lacquer finish Bach 6-1/2AL mouthpiece 4863 woodshell case FREE SHIPPING with your purchase today!